Let’s face it—for most homeowners, the bathroom is more of a practical space than a stylish one, and although you may not consider it often, it does contribute a certain ambiance to your home as a whole. Because it is used multiple times throughout your day, every day, there are some important questions to consider about the vibes you get when entering this essential room. Is it clean and sleek or cluttered and outdated? Can you relax during a hot shower or do you rush to get in and back out in a hurry? Is it boring or is it a space you actually enjoying being in? Believe it or not, revamping your bathroom can not only add value, but can also add new life to your home and make you feel more refreshed, too! For a bathroom look that is contemporary and cool, glass blocks from Innovate Building Solutions will make your shower stand out among the mundane curtains and traditional shower cubicles of the world. 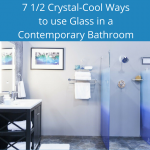 Frosted, etched, colored, straight or curved, and thick or thin are just a few of the choices that you’ll have when considering the glass blocks that are right for you and your bathroom. Using glass block in bath and shower windows is also very popular for its increased privacy while allowing natural light to brighten the space. 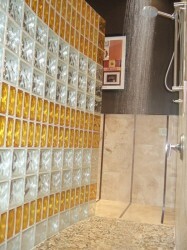 Innovate Building Solutions not only provides the specialty glass blocks that are available in multiple sizes, shapes, colors and patterns, but also the prefabricated shower or windows, making installation easier, saving on labor costs and vastly improving the quality of the finished product. We can serve as your one-stop-shop to get the job done, or simply provide you with materials and great guidance for you to do it yourself. (Subscribe to the Innovate Building Solutions YouTube channel for a variety of step-by-step video tutorials for glass block installation and bathroom remodeling.) We also offer FREE nationwide shipping for glass block shower kits and pre-fabricated wall sections, with no hidden fees or costs. Whatever look you choose, remember that remodeling your bathroom is something worth doing. Not only will it increase appeal and add to the value of your home, but will also provide you with a luxurious look and a space you can enjoy.